Online Course Registration is now available! Please read and follow the steps below carefully, to create your online course registration. The personal information collected on this application form is used to maintain Leacov Singapore’s records in processing enrolment, course survey, monitoring academic progress, application of courses-related funding and marketing purposes. By signing this form, candidate consents Leacov Singapore to use their personal information for course registration and marketing purpose. All information received or request made will be treated with confidentiality and will not be shared to any third parties unless otherwise the candidate has specifically requested it and/or provided their prior consent. For non-Singaporean/Singapore PR, a valid work permit is required. Candidate may refer to SSG-WSG website www.ssg-wsg.gov.sg for more information regarding the course funding scheme criteria. Any Government Grant is only applicable if you meet minimum 75% attendance rate and passed the assessment. The amount of funding will be confirmed upon Leacov Singapore’s submission of Training Grant Application in SkillsConnect for the candidate. All Training Grant applications are subjected to approval from SSG-WSG. If candidate has attended the same course and has received course funding before, he/she won’t be entitled to any funding for the relevant course. Meanwhile, he/she can attend the training by paying full course fee. Any false or misleading information provided by the candidate that may cause Leacov Singapore not being able to claim the course funding will make the candidate liable to pay for the full course and assessment fee. Kindly note that monthly income excludes overtime payments, bonus payments, annual wage supplements, reimbursement of special expenses incurred in the course of employment, productivity incentive payments and any allowance. Singapore PR aged 21 and above. Singaporean aged 40 and above. Payment for course fees must be made in full prior to the commencement of the class. Payment can be made using CASH, NETS, Credit Card or by utilising SkillsFuture Credit at our training centre during office hours between 9.00am and 6.00pm. To utilise SkillFuture Credit, candidate has to be Singaporean & ≥ 25 years old. 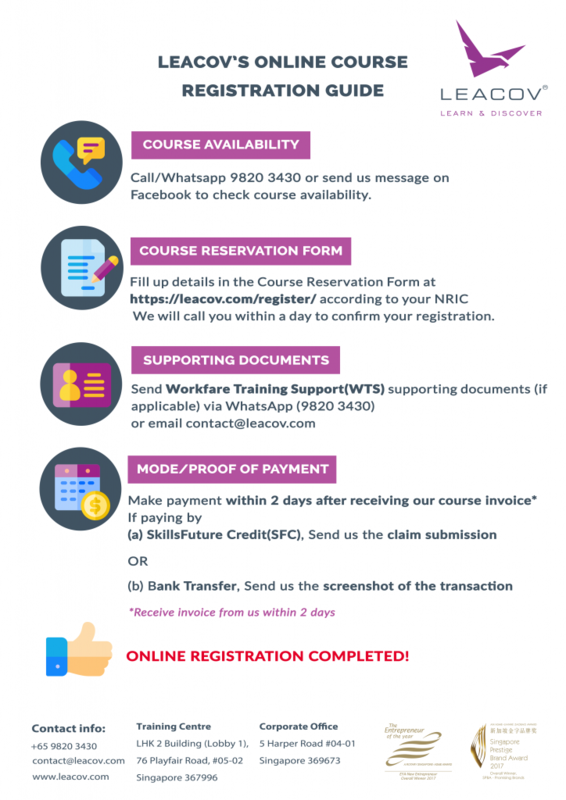 Candidate is advised to visit to confirm that the selected course is eligible for credit, and have enough credit to cover the nett fee payable inclusive of 7% GST stated in the tax invoice. Please note that Singpass is required to access SkillsFuture Credit portal. – Visit www.skillsfuture.sg/credit, log in with using SingPass ID, and select “Submit the Claim” for the relevant course. Follow the procedure to request payment to training provider. There will be no refund for candidate’s request for withdrawal/dropped courses. Please note that the course fee paid is strictly non-refundable. All final prices quoted on Tax Invoice are inclusive of GST and varies on individuals’ funding criteria. Leacov Singapore reserves the right to reschedule/cancel any class. A notification will be sent to candidate via email/sms. – Failure to commence/complete the course on the course commencement / completion date. – Termination of the course, for any reason, prior to the course commencement / completion date. If candidate would like to reschedule the class, he/she must submit a request via phone call/email/sms one week before course start date. Kindly note that any rescheduling is subjected to availability. Registrations received on or before the closing date are confirmed unless otherwise notified of any change. In any case, e-mail/sms confirmation will be sent upon confirmation of registration. Candidate is requested to reply the email/ sms to confirm their presence. Candidate is required to bring his/her payment receipt and NRIC / passport / working pass all the times when attending the courses. Any candidate who is found guilty of improper conduct/dishonesty, Leacov Singapore reserves the right to take necessary actions. Candidate is aware that Leacov would not be able to claim any government grant and the paid nett fee is not sufficient to cover the full cost. If candidate’s assessment is “Not Yet Competent” and requests for re-assessment, an administrative fee (pegged to assessment fee charged by POLWEL) will be applicable. Note that administrative fee for each course varies. For WSQ Programmes, applicants will receive a notification from SSG to download their e-Cert via www.skillsconnect.gov.sg. (approximately 2 weeks from assessment date). Please note that Singpass is required to access SkillsConnect portal. Leacov provides free coloured printing of SOA in high quality printing paper. Appointment is required via phone call/email prior collection. Upon the completion of the course, candidate will be required to participate in Training Quality and Outcomes Measurement (TRAQOM) survey sent by SkillsFuture Singapore (SSG) to his/her registered email with Leacov Singapore Pte Ltd. If candidate has not completed/attended the course on the survey form, he/she has to select an option to exit the survey. Leacov Singapore reserves the right to change these terms and conditions at any time without prior notice. I declare that I do not have any income source other than the income source(s) declared as indicate in above. I understand that I may be subject to checks for the documents submitted and income declaration made. I declare that the above information and the supporting documents attached are true and correct to the best of my knowledge. I have read and agreed to the Terms and Conditions and I understand that any false or misleading declaration that may cause Leacov Singapore not being able to claim the course funding will make me liable to pay for the full course and assessment fee. I agree to comply and abide by the decision of Leacov Singapore Pte Ltd regarding this application. I am aware that this is only indication of my interest for the course and does not guarantee me a seat till I complete my registration at Leacov's training centre. I hereby agree and consent that Leacov may collect, use and disclose my personal data, which I have provided in this form, for one or more of the purposes as stated in Leacov’s Personal Data Protection Terms and Conditions, which in summary includes but is not limited to the following:	i) Processing my course registration and ii) Sending me marketing, advertising and promotional information about other products/services that Leacov may be offering by way of Email/Call/Message. In case you may want to withdraw from further receiving updates and marketing messages from Leacov Singapore, you may either: a) write a letter of withdrawal of consent and send to our office address. b) send an SMS to +65 98203430 or email to contact@leacov.com.